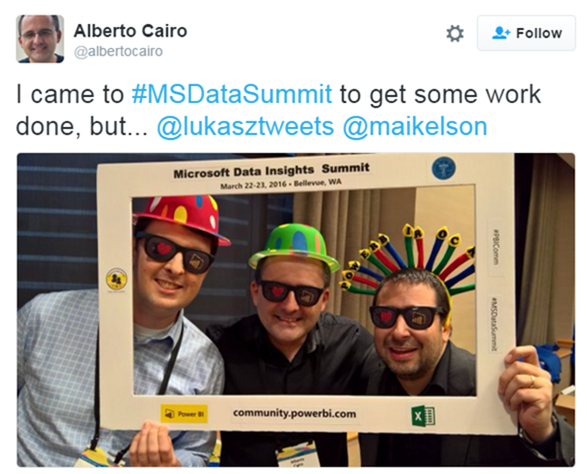 The 2016 Microsoft Data Insights Summit has come to a close after another full day of interesting livestreamed panels! Most of the sessions are already available on the Power BI YouTube channel, with more coming over the next day. You can also keep up to date on the latest from Power BI here on the blog or as part of our Community. Wednesday kicked off at 8:00 a.m. with Microsoft Principle Program Manager Patrick Baumgartner taking to the stage to talk about Power BI Insights and Analytics for Everyone. Baumgartner started out by explaining that there’s no magical fix for poor and unstructured data, so creating a solid schema should always be a top priority. He also gave a more in-depth look at three of yesterday’s feature announcements: contextual Quick Insights, integration between Power BI and Cortana in Windows 10, and an improved natural language Q&A experience. At 9:00 a.m., Senior Product Manager Aviv Ezrachi and Senior Software Engineer Arina Hantsis presented the panel Excel and Power BI: Better Together. They explained that while at first glance Excel and Power BI might look to fill similar roles in BI, they’re actually best used in tandem. Excel users can more easily share their work through Power BI dashboards and schedule refreshes. In turn, Power BI users will soon be able to analyze their reports and data in Excel. At 10:30 a.m., attendees and livestream viewers were entertained by Rob Collie, President and Founder of PowerPivotPro, as he delivered his amusing and very informative presentation on Enabling Deeper Business Decisions Using Cube Formulas and Power Pivot in Excel. Collie argued that the most popular programming language in the world is in fact Excel, with over 100 million people currently creating function-oriented formulas. Collie sang the praises of the massively upgraded “modern Excel”, with features such as auto-refresh, security options, and a near unlimited capacity for data. He explained that while it’s nice if a visualization is pretty, just having numbers that you didn’t have before is a huge accomplishment for most companies. At 11:30 a.m., Power BI Program Manager Will Thompson joined the stage to discuss Creating Impactful Reports with Power BI Desktop, or as Thompson himself renamed the panel, “15 weird tricks that will make your report awesome”. Thompson’s presentation was almost entirely demonstration, as he went through advanced techniques like using custom visuals, cross filtering, and sorting, as well as the new feature, conditional formatting. 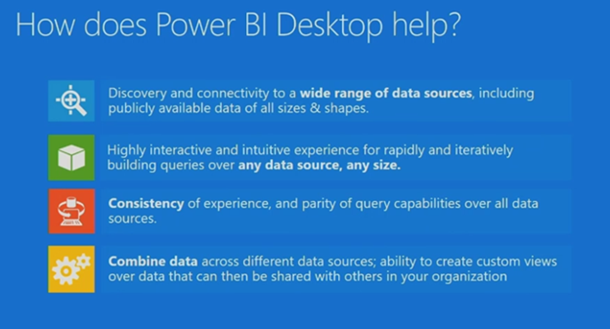 Thompson concluded with a reminder that it’s up to the users to let Microsoft know what they want to see next in Power BI Desktop through the Ideas section of the Community site. At 1:30 p.m., Microsoft Senior Program Manager Miguel Llopis returned to the livestream, this time to talk about Mashups and Data Modeling with Power BI Desktop. Llopis emphasized again that it’s challenging to acquire data, as finding and connecting disparate sources can be tough and in many cases connectivity is too fragmented. 80% of the work of a data analyst is preparing data, and just 20% is making it look good. 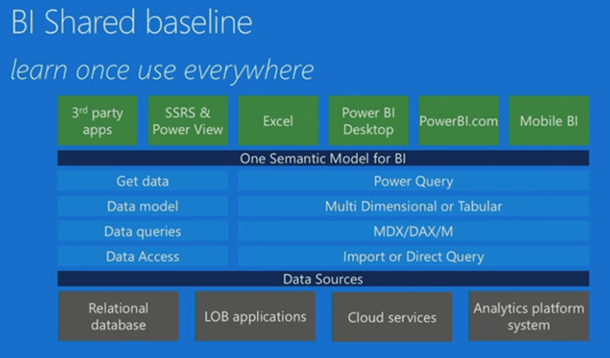 Llopis presented some ways that working with Power BI can reduce this difficulty and make it easier to repeat your models. 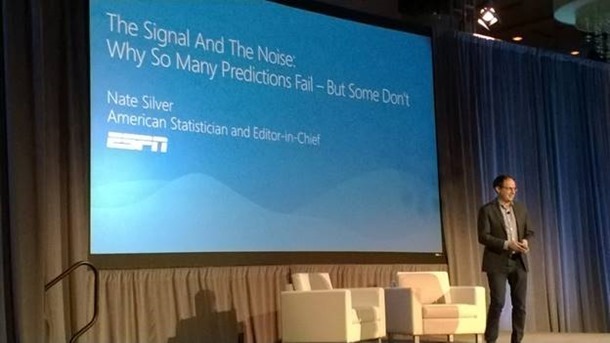 At 3:00 p.m. the last presenter took to the stage: infamous statistician Nate Silver, author of New York Times Best Seller The Signal and the Noise. Silver spoke to a packed house about the present and future of “big data”, and how those who handle it on a daily basis can survive the current hype cycle and its inflated expectations. In his presentation, Silver touched on common problems that can occur when working with big data, including managing the signal-to-noise ratio and not overvaluing algorithmic feedback. He also outlined some suggestions for minimizing the impact of these problems and advocated that anyone who works with data should do frequent “sanity checks” throughout the whole analysis process and not just at the very end. And that’s a wrap for 2016’s Microsoft Data Insights Summit! We hope you can join us in person next year to meet your industry peers, learn more about Power BI, Excel, and data analysis, and perhaps even have a little fun at the same time.